We have all heard of it. Getting blacklisted is the Boogie Man of Digital Marketing, with the only difference that this is completely real (based on my assumption that the boogie man is not!). But what exactly is this powerful force, how can we prevent it and what to do if you ignore all my advice, is to follow. 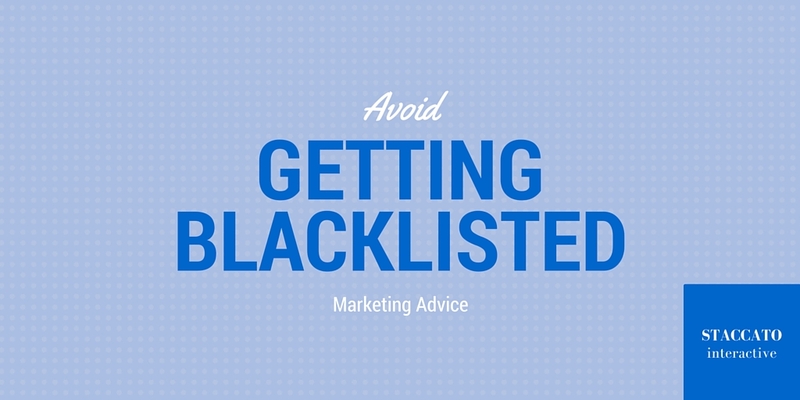 Blacklisting is usually the result of bad email marketing, or ‘spamming’. SPAM is basically any kind of unsolicited email. By sending email to only to those who have requested to receive it, you are following accepted permission-based email guidelines. In other words, SPAM is any non-consensual email communication from a company to a prospective customer. Certain online entities like mxtoolbox.com police the quality of email marketing with certain rules, and breaking those rules is penalized with the blacklisting of you server. Most email marketing tools will also notify you somehow if you are in danger of getting blacklisted. You should always have consent from everyone in your targeted list. Buying a list from a vendor and emailing them IS considered spam. Be honest with your subject line. You will find a lot hype on things like “Do not use the word ‘free’ in your subject line.” While that is important advice to heed, the most important thing is to deliver a message directly related to your subject line. Always have a visible way to unsubscribe. If you cannot provide a direct link to unsubscribe from your email campaigns, leave detailed instructions and make sure you remove them withing 48 hours of the request. There are ways to test your email campaign before it goes out. Free sites like mail-tester.com will help you identify if you are missing any of these points above. What to do if you ever get blacklisted? I hope you never get blacklisted, but if it does happen, I want to at least give you a starting point to rectify the situation. First, find out if you are really blacklisted with this link: http://whatismyipaddress.com/blacklist-check. It will also give you an idea of why you got blacklisted. Try to find help. Someone who has worked with this type of problem before may be able to get you blacklisted faster and with less hassle than if you try it by yourself. Self-Service Removal. There are a few blacklists with a self-service removal feature that lets you take your IP address off the list without much trouble. However, you’ll want to make sure you’ve resolved any issues before doing this. If you don’t and your IP address gets listed again, it won’t be easy to get it removed the next time around. Time-Based Removal. Most blacklists have a built-in, automatic process that removes lower-level listings (IP addresses that are light offenders) within a week or two. But if the IP address had sent spam more than once or sent a high volume of emails, the time period will be longer. In closing, I hope the most important takeaway that you get from this post is to follow the rules. As long as you stay honest with your subject lines, only send emails to people who have opted in to receive emails from you, have an unsubscribe button readily available, include your company’s physical address, and avoid sending from a group alias email, you will likely avoid getting blacklisted. The rules are there for a reason; people simply do not want to be receiving spam emails from companies, and you want people to read your emails rather than automatically delete them anyway! In the off chance that you do somehow get blacklisted, you should follow the steps I’ve outlined above. Getting blacklisted is fixable, but it is a problem and hassle that is best avoided if possible.